Occipital kiss, the cutest kiss ever! Ahhh, occipital kiss, a kiss on the back of the head. Yes, the cutest kiss ever! Oh, very innocent kiss! 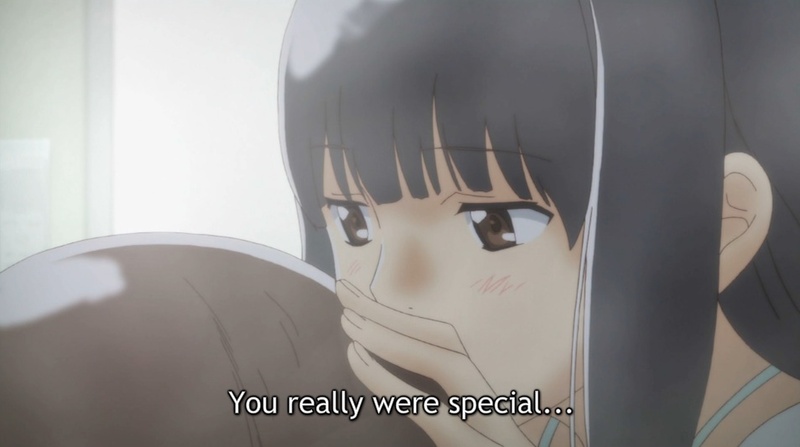 Hourou Musuko or Wandering Son was a shocking anime, and Saorin, a very pretty tsundere heroine, gives a kiss to Nitorin, a transvestite boy. Ohhh, I must dress up like a girl then! 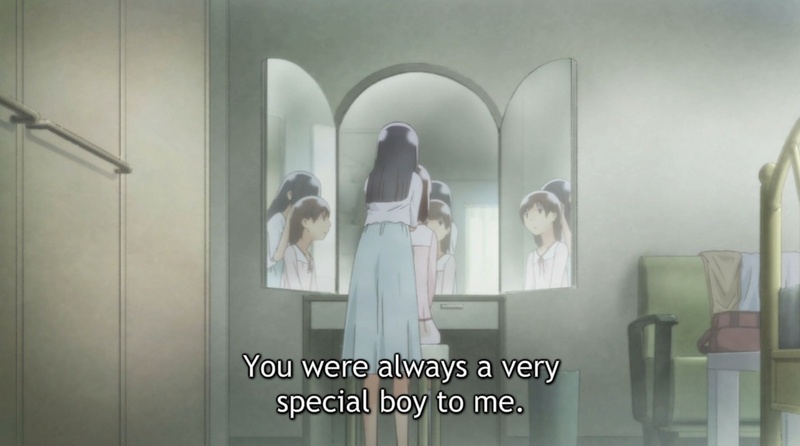 Not only Saorin but the other two girls, a tall basket ball team girl and a teen model, are attracted to a cross-dresser. Yes, three girls at the same time! Oh man. How come I’ve become so manly? My jaw is too squared, my cheekbones are too big, and I got thick beard. Even if I shave with the sharpest razor on earth, black dots are still visible and my jaw looks grey. And my legs are too hairy to shave. It’s too cruel. I wish I had a woman face like Nitorin. And at the same time, girls were getting more attractive. Their breasts were getting bigger, their midriff more curved, and their hips more rounded and prominent. While I was getting uglier and hairier, girls were getting sexier and cuter. That was really unfair. Talk about gender disparity. Yes, of course there were some girls that didn’t get their breasts bigger, the unlucky ones. Maybe they didn’t drink enough milk. They should’ve drunk Musashino Milk. But yes, I was rather exalted than confused with this new emerging irresistible lust. The lips of girls, ah, how much I wanted to kiss, or the back of Haruka’s knee, or Kaoru’s navel, the desire to get connected with girls physically, yes, skinship! I envy Nitori or Johan, who can dress up no problem like a girl. They can camouflage their monstrousness. But I can’t. Though I cross-dress myself, obviously I’m still a monster. I can’t be like Hazumu from Kashimashi. Neither Hideyoshi nor Mizuho. So, the only way to obliviate and obliterate the fact that I’m a monster is try unite with girls. Yes, make me forget 3D pain! And the first gate to that path is kiss! 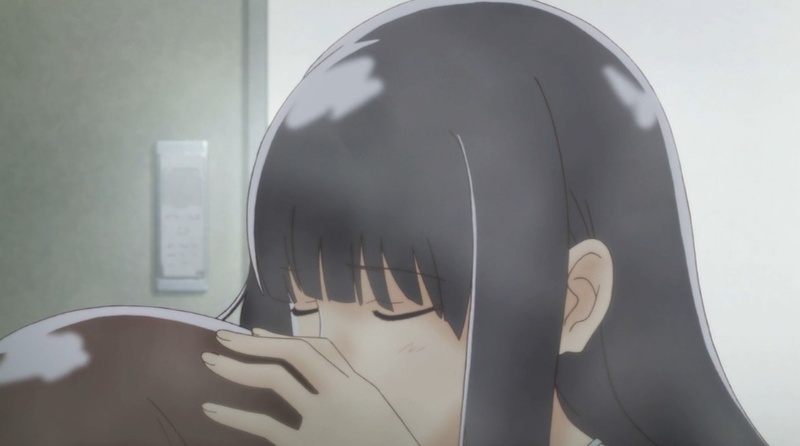 I wish I had a girl like Saorin in my high school years. Not directly on the lips is so cute and innocent! It’s so loving and caring. A girl taking care of your wig in front of the big mirror, and then suddenly she feels sentimental and kisses you. Yes, in her room, in girl’s territory! Ah, that’s so cute. How awesome. I never went to girl’s room in high school… She’ll brush your hair in front of the mirror and do the makeup for you. 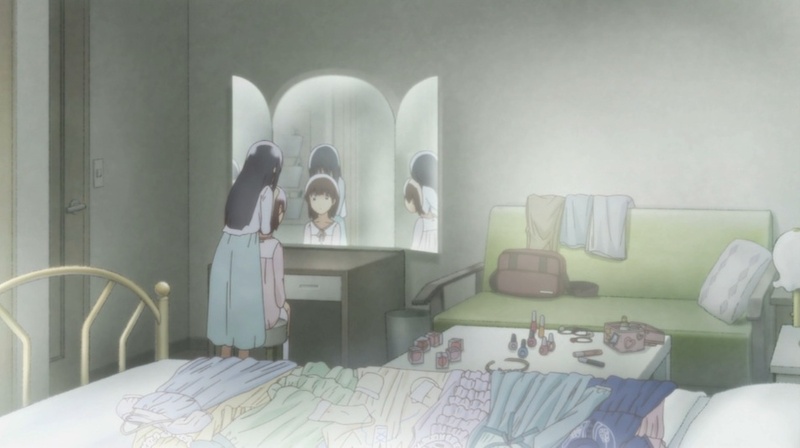 Maho-shojo (puella magi) has the most sacred item, a mirror, so she can transform. Yes, the power of transformation! But not for me. Yes, “from behind” is very important. A direct smooch right in front of the face could be challenging for some. But a kiss from behind would be more naturally accepted. Like Mio snuck up behind and hugged Tetsurou in AnoNatsu. Mio’s oppai is wonderful! Warm embracing or kiss from behind. A kiss on the back of the head and a sensation of bouncing oppai on my back are my salvation!